The focus of my artistic inquiry is the deconstruction and reimagining of the painting tradition. The bulk of this study is manifest in site-specific installations composed of the detritus of artists and artisans. Collecting, categorizing and displaying found materials, and examining the relationship of these displays to painting, drive my practice as an artist. I consider myself part of a generation of artists who are reinvigorating painting for the 21st century by expanding the materials and vocabulary of painting. I work with recycled non-traditional materials that I repurpose into paintings, which I install on architectural structures such as walls. Investigating the meaning assigned to materials often leads me to new discoveries. 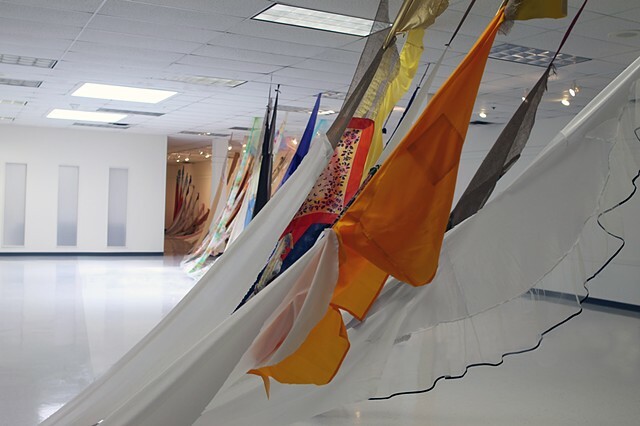 For this installation, I chose to use textiles that had already been circulated through second-hand stores multiple times. The connection of these items to our community points to the narratives of those who donate, those who purchase and those who are hired, trained and helped by facets of the organization. Responding to the existing architectural elements of this room, I focused on the light, color, texture, transparency and opacity of the fabric in order to make compositional decisions. 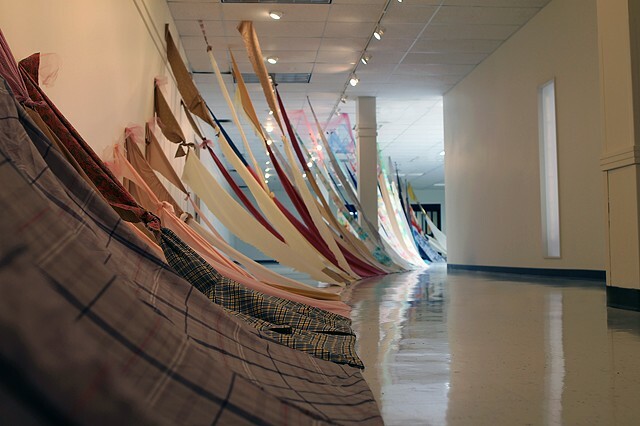 The material was then cut, pinned, knotted and sewn in order to create the installation, Stories Untold.